Happy Star Wars Day – May the 4th Be With You! And the first Friday in May is National Space Day! So, tomorrow, May 4th, 2018, is truly a space-lover’s day! Besides a movie marathon, what better way to spend your day than by learning about what it actually takes to get to space! If you are like me you know – vaguely (read almost nil) – about how much engineering, technology, planning, creating, and training go into getting a rocket to the lift-off stage. Think of the engineering and mechanics of building a space rocket which can safely be launched into space, orbiting the earth or the moon and coming back to earth – or traveling across the galaxy to planets like Mars. How did we get to the point where we actually can put human beings into a machine and blast them into space? 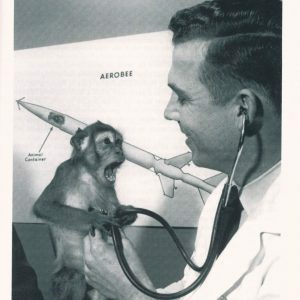 Between 1948 to 1960, animals, biologically speaking, were the space program. 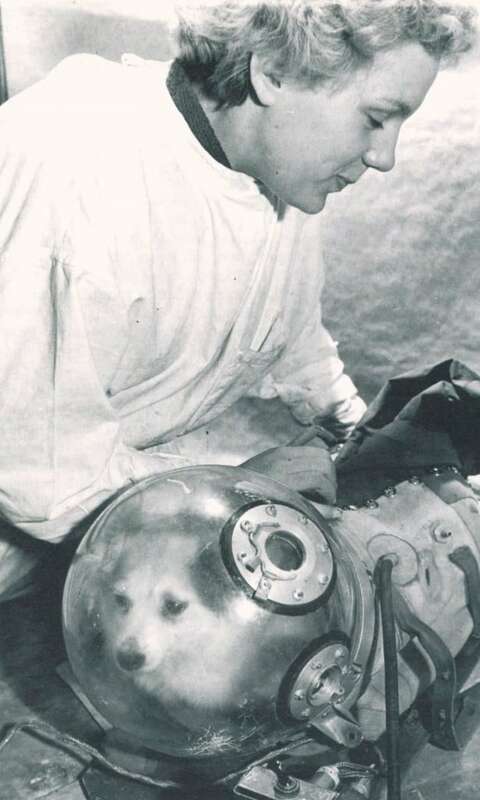 Animals were the test subjects who were used to understand the effects of acceleration and deceleration, vibration, noise, extremes in temperature, weightlessness, and all the other hazards which might be limitations to sending human beings into space. Briefly, dogs and monkeys were used in those first biological tests. Capsules were built around them and extensive training and preparation went into getting them ready for their flights. Engineering those first capsules was complicated – the engineers and scientists had to work together to design a capsule which would hold an anesthetized monkey, enough oxygen to last about 2 hours, chemicals to absorb the carbon dioxide from the breathing monkey, with enough room for the instruments needed to measure breathing and heart rate. The monkeys also needed to be chosen and prepared. Two Macaca mulatta rhesus monkeys were chosen because of high intelligence and physiological similarities to humans. The Project was dubbed “Project Albert,” although no one is quite sure why. The first capsule wasn’t pretty – it needed extra welding and caulking to be sure it was airtight, but was satisfactory! An anecdote about one of the 2 monkeys: One of the monkeys managed to escape through a broken window. Three weeks later the air force base received a letter from the Tampa City Police Station, stating they were holding a captive monkey. The wayward monkey snuck into a woman’s immaculate kitchen which surprised both her and the monkey. The monkey threw teacups and saucers at her and she chased him around her kitchen. She had to be compensated for her broken crockery and the monkey was taken into custody! 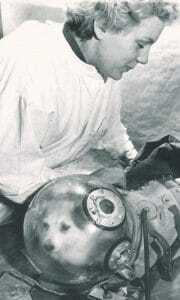 Kozyavka is readied for one of her flights in 1956. Photo from author’s collection, Colin Burgess, “Animals in Space” pg. 72. For more fascinating stories about animals and space flight check out Animals in Space: From Research Rockets to the Space Shuttle. All the flights the animals took were the precursor to human beings rocketing into space. It has been said one of the biggest problem of space flight is the human machine. A person has a fluctuating metabolism, come in different sizes, needs oxygen & food, etc. . . . Planning for humans and space flight or life on a space station includes preparing for a myriad of possibilities. Ever thought about bathing in space? Gemini VII was launched on Dec. 4, 1965 as a medical “dress-rehearsal” for the Apollo program, before which there was a two-week simulation. Minimal meant “no bathing or sponging of the body, no shaving, no hair and nail grooming . 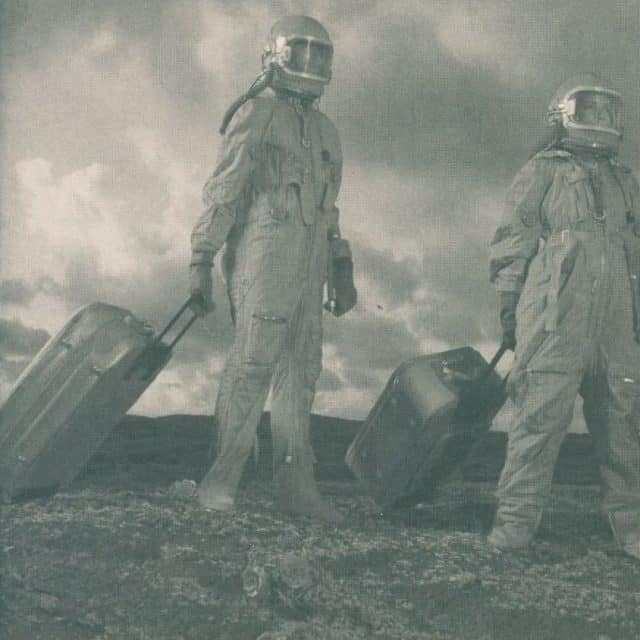 . . no changing of clothes and bed linen, the use of substandard oral hygiene, and minimal use of wipes.” (Packing for Mars, pg 194). One team of subjects lived and slept in these conditions for 4 weeks. Socks and underwear deteriorated and had to be replaced. When the subjects removed their helmets (and the body odors escaped) the stench was literally nauseating. The test subjects were then ushered, one by one, into a shower and the scientists would collect the runoff for scientific analysis. (yes, really). Now think about all the research, testing, and trials that have gone into how to handle bodily waste. . . and the training the astronauts must go through to use the space toilet. Without gravity the astronaut is actually not sitting on the toilet seat . . . And, oh yeah, there is drinking urine that has been run through a charcoal & osmosis bag… and motion sickness – are you throwing up? or down? However you choose to celebrate Star Wars Day and International Space Day – think about all that goes into – and all that went before – launching a rocket, with human beings, into outer space! May the F=mA Be With You!